If you are up for an adventure that is full of fun, reading, learning and some fantastic PRIZES then join Audrey Press, Valarie Budayr and 5 awesome blogs (including Mom to 2 Posh Lil Divas!) 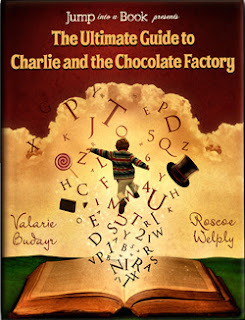 for the Ultimate Guide to Charlie and The Chocolate Factory's Golden Ticket Giveaway! What is The Ultimate Guide to Charlie and the Chocolate Factory? It is an interactive book based on the beloved children's classic of Charlie and the Chocolate Factory, the boy who wins the golden ticket and enters the magical world of Willy Wonka’s Chocolate Factory. With The Ultimate Guide to Charlie and the Chocolate Factory you can literally join the reading adventure by virtually “jumping” inside the pages of the book as each chapter is a gateway into a magical world. Now available on iTunes, The Ultimate Guide to Charlie and the Chocolate Factory, allows you to feel and live the story like never before. With over 20 crafts and activities that the entire family can enjoy, the book allows children and parents to re-live the wonder that Charlie experienced during his trip through Willy Wonka’s world of magic and chocolate. Readers can learn where chocolate comes from or how gum is made. They work their way through mazes, puzzles and games, and so much more. The best part is that the adventures can be done at your own pace, providing family fun anytime you want. Audrey Press CEO and author of the book, Valarie Budayr is celebrating the launch of this interactive e-book by sending you on an adventure through 5 hand-picked blogs in search of 5 Golden Tickets. Starting today (September 13th), you are invited to visit the following 5 blogs and locate the Golden Tickets. Visit each of the 5 blogs listed below. Find the Golden Ticket hidden in a blog post written/published within the last 10 days - one Golden Ticket per blog. Note the link to the post where each ticket is hidden. After locating the 5 Golden Tickets on the 5 participating blogs, enter the sweepstakes on Ultimate Guide to Charlie blog. Winners will be chosen September 24th, 2012. The 5 keepers of the Golden Tickets?? $50 gift card to iTunes. Update - winners announced here! Disclaimers: No purchase necessary. You must be 18 years or older to enter, only one entry per household. Staff and family members of Audrey Press are not eligible. Grand Prize winner has 48 hours to claim prize. If Grand Prize winner is outside of the US and Canada, they will be given an Apple Gift card to use for their iPad purchase. This has been a favorite book of mine since I first read it in 4th grade! Thank you for being an awesome blogger, I love your ideas and the others you link up with are great too! I'm a pharmacist mommy to a 3 and half year old girl and 13 month old son but keep my kids at home because daycares make me uncomfortable. The ideas you post are such a great tool for me! I hope you have a great school year as well as your girls! Thank you Ashley! You have put a smile on my face this evening s I read your lovely comment. I am so glad that you are able to find some inspiration here. Thanks for joining us and I hope that we will continue to inspire you. Where do you go to see who has won?